Ceilings are often the forgotten surface in the room. Every other wall is treated, but the 5th wall is equally as important as the others. Actually, it might be more important. Because it stands alone it can be a perfect spot for a feature or focal wall. In treating ceilings you must be careful. First you don’t want to bring too much focus to the ceiling. It needs to be a subtle accent or a comfortable part of the design. Often, white is the chosen color for ceilings which only draws attention. The last thing you want to do is draw attention to a ceiling that is flat and uninteresting. Here are a few of our favorite ways of treating ceilings. 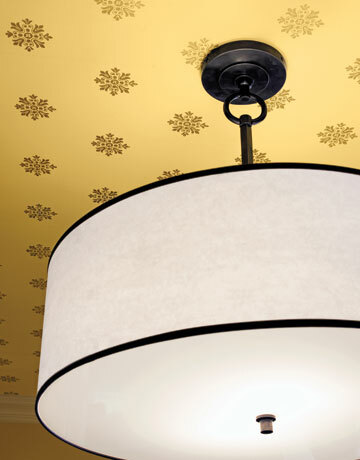 Try a rich wallpaper or something with texture on your ceiling, specifically if you have a tray ceiling or niches. Don’t go too bold so it is the highlight of the room, but adding interest at the top level creates a comfortable overall atmosphere. We love using small plaids or a grass cloth to get just the right design and texture for your ceiling. Wallpapers can also have a design that can be painted. This way you get a great color and pattern. Medallions add much for detail and come in a variety of shapes and sizes. You can pair with finish work or medallions can stand alone for an inexpensive way to add detail. Custom designs in finish work that fit the style and dimensions of the space are ideal. Included in this category are crown moldings which can be simple or elaborate. You might create faux beams or paneling or add a simple perimeter panel mold around the space. Even simple solutions can add drama. Pair the molding with a accent color or wallpaper and take your look one step further. Think about the room’s design before you go too crazy on the ceiling. It must not over power. You must consider the room’s layout when creating your finish work design for your space. 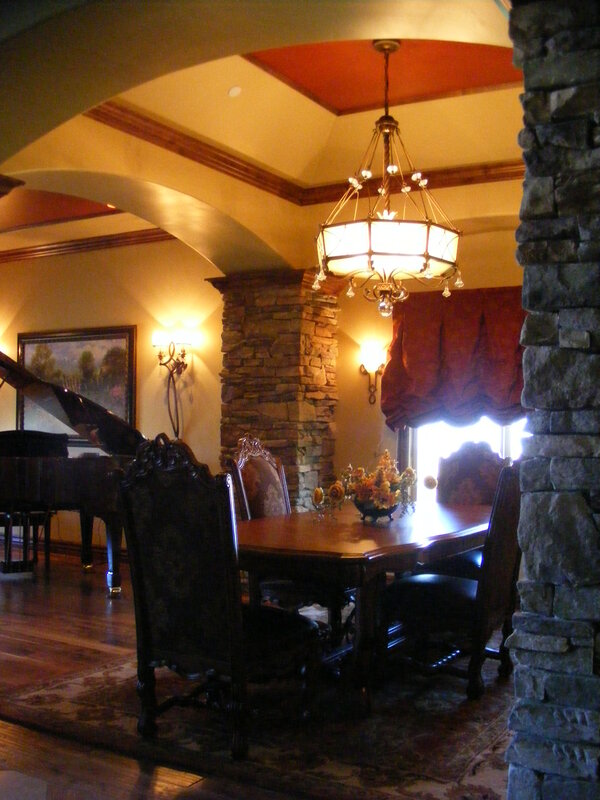 If you happen to be remodeling or in new construction, remember that you can do so much in the framing of your ceiling. Strange vaults are not ideal. 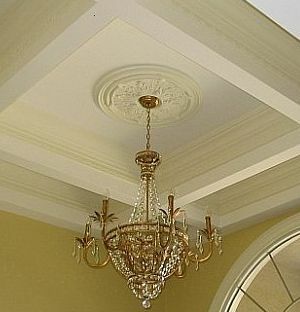 Going with high ceilings with simple center vaults or tray ceilings are the best. Vaulted ceilings tend to be difficult to do anything with besides paint. Be sure large vaults are symmetrical and make sense to the space plan below. When you can, keep your ceilings high (around 10′ for the main floor) and go for the details.